How to find the best browser for Android? There are many browser options available to you. You may be using Google Chrome for its interesting doodles or Firefox for security reasons. You may have tried UC Browser, too. But today, try out the best browser for Android in town: Opera Mini. Not only is it the fastest web browser in the market, it also saves data and even saves you from frustration. 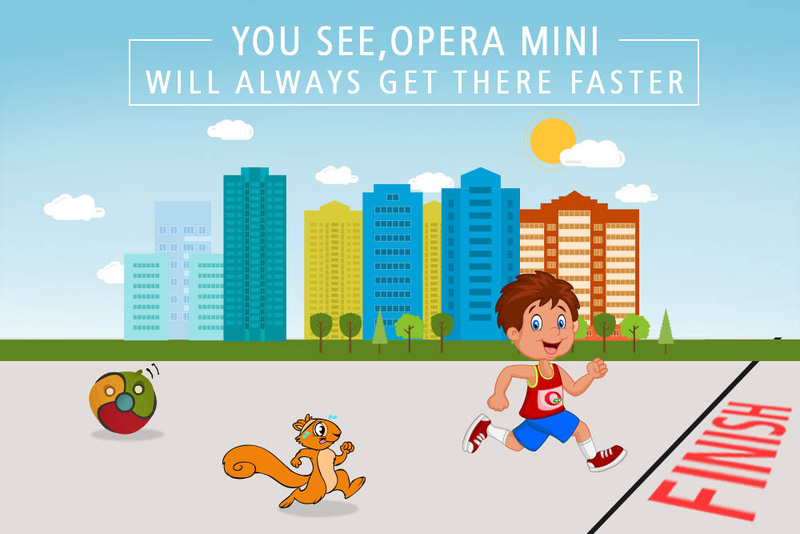 We’ve said it before, and we’ll say it again: Opera Mini is the fastest browser in town. 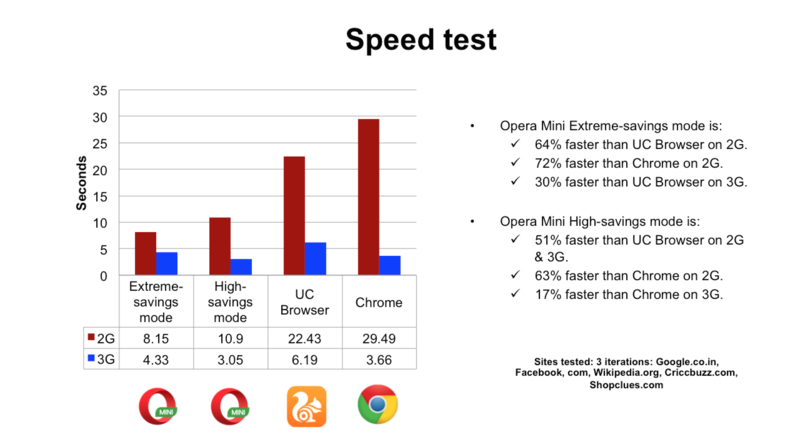 New test results show that Opera Mini is 72% faster than Google Chrome and 64% faster than UC Browser. Facebook, Google load significantly faster in your Opera Mini browser. Nothing beats the joy of fast browsing. How is this possible? Opera Mini features a compression technology, which shrinks down webpages to as little as 10% of their original size before landing on your phone. Fewer megabytes means you get to download pages faster. Do your own speed test! Got a data cap or paying per megabyte? Internet packages like these can really burn a hole in your pocket (especially if your parents are footing the bill, “What, recharge again?”, yep, we’ve been there). While we can’t pay your phone bills, we’ll make sure that you get the best of your data package (hint: it’s by using the best browser for Android). Opera mini saves you up 90% of your data. It uses 3.5 times less data than Chrome and half as much data as UC Browser. Visit more number of websites and read more online with the same limited data plan. 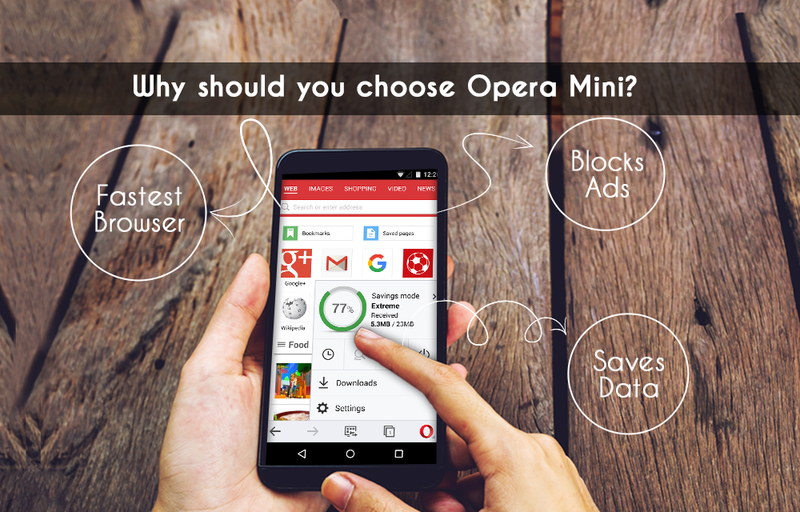 You can even track your data savings right from Opera Mini! Hate annoying, distracting ads that take up half of your phone’s screen space, slow down your browsing and eat into your data package? Opera is the only major mobile browser with a free built-in ad blocker, so that you can get rid of ads with a click of a button. 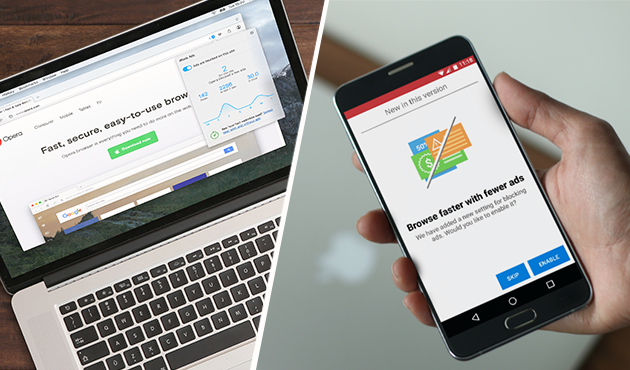 Do more, by loading webpages 40% faster with the ad blocker feature enabled. It also saves you an 14% additional data, on top of the data savings Opera Mini already brings with compression. So block ads + browse faster + save more data. One word: Opera. If you love to watch video on your mobile, you’ll love Opera Mini’s video compression technology, which reduces the size of video data and combats buffering delays. The video boost feature will lessen the video loading time for you, save you even more data, and let you bid adieu to the dreaded buffering wheel. Just tap the “O” menu and change to high-savings mode, then tick the video boost option and start watching videos with fewer interruptions. Did you know that Opera is the first browser to integrate this feature? Best browser for Android and we mean it. The feature is also available in Opera Mini for iOS. Opera Mini supports over 90 international languages. This includes Arabic, Hebrew, Persian, Romanian, Bulgarian, Indonesian, Assamese, Greek, Korean, Dutch, Chinese, Bengali, Italian, Kashmiri, Vietnamese, Urdu, Croatian, Afrikaans, Malayalam, French, Russian, Marathi, Slovak, Oriya, French, Spanish, Punjabi, Norwegian, German, Polish, Tamil, Japanese, Telugu, Danish, and many more . You can easily choose your favourite language in the settings and feel at home. Of course, we’ve got tons of other awesome features like ‘Discover’ that helps you get fresh, curated content everyday, and there’s even a night mode so a bright screen doesn’t strain your eyes in the dark. You can also add your favourite websites as shortcuts on the Speed Dial start page, so that your top sites are always at your fingertips. But since we promised to give you just 5 reasons, more on that another time! So what do you think? 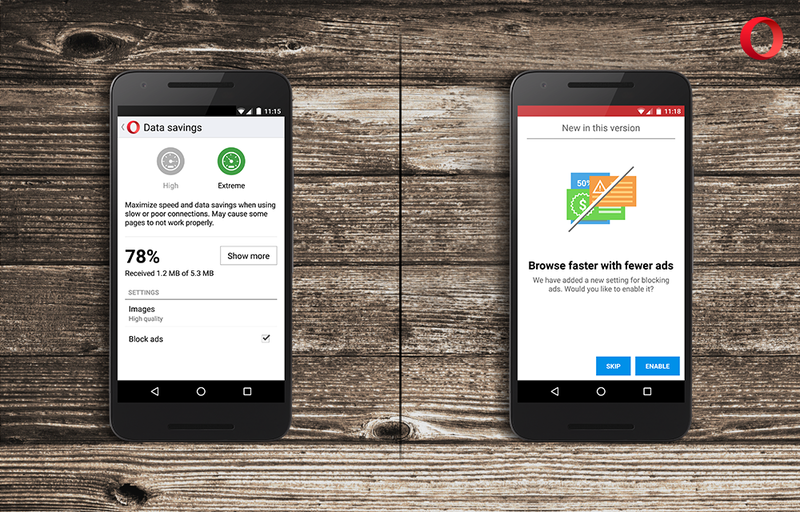 Is Opera Mini the best browser for Android? We’d love to hear your feedback. Share your views in the comments below or you can write to us on Twitter and Facebook.